Suddenly, there was a sound from heaven like the roaring of a mighty windstorm in the skies above them, and it filled the house where they were meeting. The main light source for this scene comes from the two beams of sunlight, coming into the room through the small, high windows on the left of the scene. In the foreground, from left to right – Thaddeus/Judas (son of James), an unknown disciple with his hands over his ears! ), James (son of Zebedee), John (son of Zebedee), an unknown female disciple is on the right. Behind them are 3 disciples un-named in scriptures, a man looking through his fingers in fright!, with a woman & man in head dress & turban, respectively. Behind them, we can see a married couple, holding hands & wondering what is going on! Behind them & in a group on the left are most of the other (named) disciples; from left to right: Matthew/Levi, James/Cleopas (son of Alphaeus), Andrew (with his hands interlaced in prayer), Bartholomew/Nathaniel, Simon/Peter, Simon the zealot. Behind them all is Mary Magdalene. 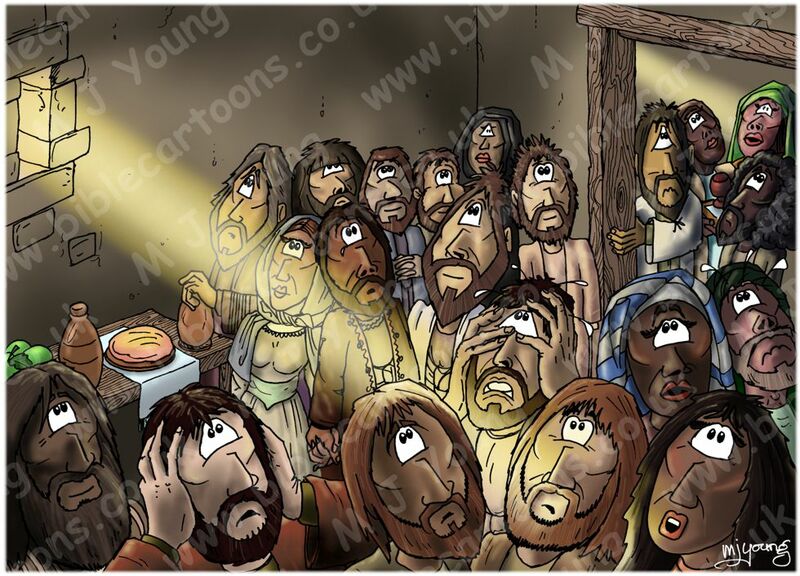 In the background, on the right are Thomas/Didymus (hanging on to the door frame) & Philip (with dark hair), behind them are two un-named women disciples, one of whom is carrying a tray with a pottery cup on it. 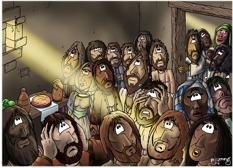 This scene is based on one I drew some time ago, Acts 02 – Pentecost – Scene 03 – Fire, which was completed in December 2009, & shows the tongues of flame resting on the disciples heads. This scene (Acts 02 – Pentecost – Scene 02 – One place) is set only a few seconds in the narrative before Acts 02 – Pentecost – Scene 03 – Fire. As with the previous pictures, the scriptures tell us there was “a sound from heaven like the roaring of a mighty windstorm in the skies.” I have shown various responses in the disciple’s faces & gestures, to the storm sound; some are frightened, some bewildered, some awe-struck, some calm, some prayerful, some composed. I am particularly pleased with the strong lighting effect I have managed to get into this scene.